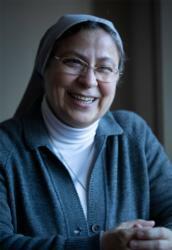 WASHINGTON (CNS) — Sister Annie Demerjian has seen a lifetime of suffering in Aleppo, Syria, over the past seven years. Now, as conflict is beginning to die down, her ministry is no longer about getting emergency supplies to those in need as buildings collapsed and food, water and electricity were scarce. The current challenge is to help people begin to rebuild their lives. “We are now living the consequences” of years of civil war, she said. As the Syrian city finds its way out of the rubble, Sister Annie and three other Sisters of Jesus and Mary are at work, reopening garment factories and helping people find jobs and develop job skills. “Before, we were living day by day or minute by minute,” she said, stressing that she and the other sisters never knew when bombs would fall or who would die next. “It was a big fear,” the 52-year-old sister said in Washington Nov. 27. She was visiting to attend a Nov. 28 prayer service — sponsored by Aid to the Church in Need-USA — honoring today’s Christian martyrs at the Basilica of the National Shrine of the Immaculate Conception. She planned to speak to the congregation about enormous suffering in the region and the task of rebuilding. The death toll from this war is staggering. Earlier this year, the British-based Syrian Observatory for Human Rights said at least 511,000 people had been killed since fighting began in Syria in March 2011. The U.N. Refugee Agency said 5.6 million Syrians have left the country and 6.6 million are internally displaced since the war began. Of those who remain, millions need humanitarian assistance and health care. More than 86,000 lost limbs. Sister Annie said children in particular are suffering, especially the 3 million born during the war who only know of violent destruction. More than 20,000 children were killed in the war, and 2.8 million children have been uprooted from their family homes, she added. When the fighting first began, Sister Annie and four other sisters in Aleppo who were teaching at the time were told by their provincial that they could leave. They chose to stay, saying they had lived there in good times and would stay during bad times. “For us it’s been a very painful experience, but to be present makes a difference for us and our people,” she told Catholic News Service. And now, she said, the focus is on “supporting our people and letting them stand in dignity to start a new life,” stressing that the easier part is the physical rebuilding. “Rebuilding the heart and soul” is the bigger challenge. She also knows that news about the war in Syria has fallen off the radar for many people. In prepared remarks for the vespers service, Sister Annie likened the situation in Syria to someone recovering from a serious operation. “We need to be aware,” she said. “We can’t just turn the channel” and look away.